Here we are in 2017, with the Suidlanders endlessly screeching about our imminent demise. Meanwhile, 30 years ago, we were a force to be reckoned with, the greatest force on the continent. I found an interesting front page of the Aida Parker newsletter from September 1986, when things were already pretty hot here and the war and heat was going to increase. By 1987 full scale tank and artillery battles would be raging in the former Portuguese colony of Angola as white South African men were fighting a communist army of Cubans and blacks, led by Russian officers. This image was good enough that by resizing it you can actually read it. It makes for interesting reading. This was long before I knew of Aida Parker. 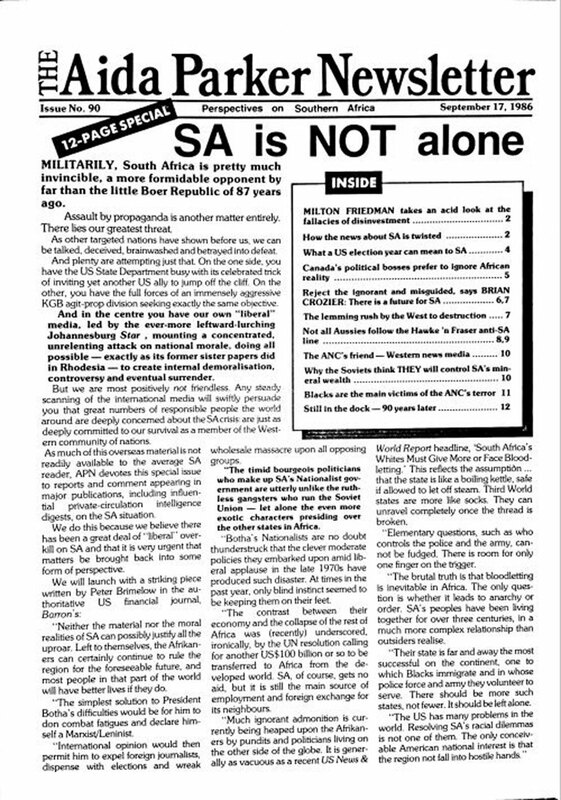 But in here notice her describing the white South Africans as being invincible militarily (which was totally true) and that the main threat was propaganda. As usual she never mentions the Jew (nor did anyone else). But notice further on how she describes the “timid” National Party leaders of the time, and this under PW Botha who was the best we had. This mention of timidity is true. When I think back to that time I don’t think the politicians were in any way inspirational. Their weakness and timidity ultimately flowed down to the whites at the lower ranks, but it was the whites at the lower levels who were all game for a fight. The weakness came from the TOP. But those at the top were very much in touch with the Jews especially scumbags like the Minister of Foreign Affairs Pik Botha who played a key role in kicking Botha out and getting FW De Klerk in. But I heard from SADF Officers I knew that in Aida Parker’s house were extremely important meetings – high level people came and trusted her and they gathered in her house! But none of this is documented anywhere. This is the same Aida Parker who was a Christian Conservative, and yet she told me to my face that when she was young at university, that she had been a communist. Shades of the Jew David Horrowitz in the USA – a raging communist in his youth and a Pro-Israel, American conservative nowadays! Read this page. You’ll find it interesting. This will give you some idea of how things were back then. Notice the mention by Aida of the “Liberal Mass Media” – read: JEWISH CONTROLLED MASS MEDIA and how it was leaning left! Exactly! A rerun of modern America! So how was it that the whites had massive, organised military power and yet, they just folded? The answer is that the weakness, the treason – came from THE TOP! When the people at the top are WEAK, it ultimately sets the scene for everything else! See my video: What Hitler tried to teach Germans and ALL whites HERE. Everything flows from the top down and this is why the Jews love “democracy” because it opens up so many weaknesses and its a playground for them to break and mould everything the way they want it. But watch the Hitler video. You’ll learn a lot. Notice she quotes Milton Friedman. If you look closely at her material you’ll see many Jews quoted without once mentioning that they are Jews! Typical of my life here in Africa. The whites NEVER see the Jew standing right next to them and I was the same.